Sure, we love having a collection of classic blue jeans in our closet, but sometimes you just need a change. Enter, black jeans, the edgy cousin to our standard denim staples. Whether this denim basic is a part of your regular wardrobe rotation or not, it’s smart to have cool black jean outfits up your sleeve for any occasion. In one simple step, this dark-hued alternative will give any ensemble an instant air of cool, and it’s easy to see why. Black jeans have been a major part of fashion from as early as the 1950s in the beatnik culture (think: Audrey Hepburn in cropped black jeans). From there, these dark pants have been a staple among counter cultures up until today, where they’ve taken over as a fashion staple everyone should have. If you’re in the need of some styling inspiration with black jeans, we’ve got you. We gathered some of the best looks from our favorite fashion girls on how to wear the edgy favorite this fall. Check them out now, and then shop each look for your own below! 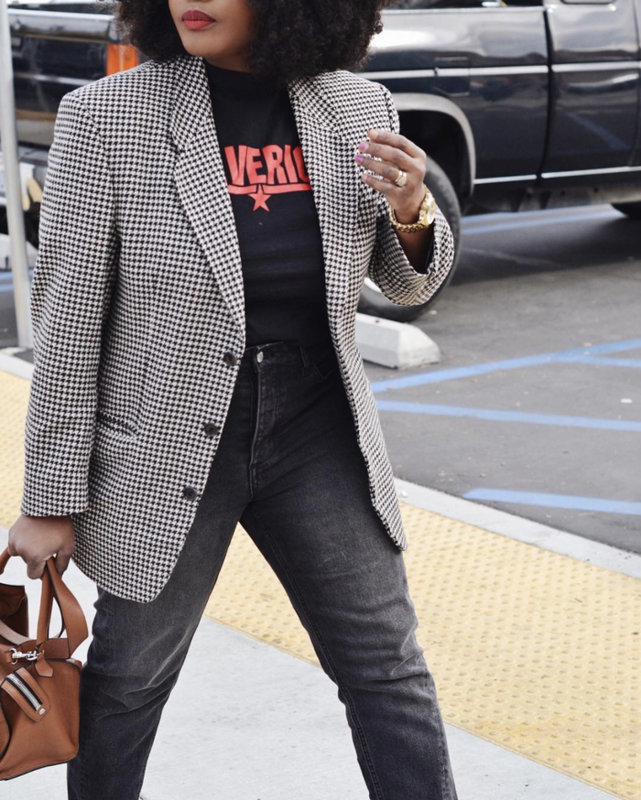 Dress up your standard jeans-and-tee combo with a classic checked blazer. We’re still not over the checked blazer trend. You’ll never go wrong with a cool girl–approved ensemble of black jeans and a moto jacket. You’ll wear this so much during the fall. Contrast the edgy vibe of your jeans with pieces with fun embellishments such as pom-poms. How fun is this sweater? A pretty floral blouse will always look good with a pair of black jeans. A blouse so pretty that you’ll want to show it off. You need a pair of flares in your denim collection. Take your denim-on-denim ensembles to the next level with an all-black version of the look. Swap out your blue denim jacket with a black one. For a cool, fall-appropriate all-black look, wear your black jeans with a wool coat to keep yourself warm. This is totally worth the investment. We love mixing up our workwear with more casual pieces. Pair a polished blazer with jeans and sneakers for an unexpected ensemble. A perfect blazer for fall. We can’t get over how flattering flare jeans are. Wear yours with a puff-sleeve blouse for an instant touch of elegance. Everyone needs a little smocking. You can’t go wrong with a pair of black jeans and a chic T-shirt. You can never have too many cute T-shirts. Say hello to your next favorite pair of jeans. Swap out your favorite white tee and opt for a black version to create an easy all-black outfit for those warmer fall days. A classic black tee will be so good for fall. You can’t go wrong with a pair of skinnies. Throw a statement sweater over your favorite pair of relaxed jeans for a cool fall look you can wear into winter. Now this will make a statement. Wear your favorite corset tops into the fall by styling them over a classic button-down top. With a pair of black jeans, your ensemble will be so chic. Wear these on your next night out. We’ll never get over the combination of a bright red sweater paired with black jeans. Dress yours up with workwear pieces, like a blazer and loafers. A cabled sweater is perfect for the fall season. A pair of cropped flares will be a fresh alternative to your skinnies. When wearing an all-black outfit, add a jewel-tone piece like a structured blazer to give it some color. We can’t get over this color. These have an air of edge. Brighten up your fall ensemble with a pink overcoat to stand out among the dark neutrals. This will keep you warm all season. Wear these on casual Fridays. Contrast your all-black outfit with lighter accessories to give your look more depth. You’ll look so cool in these. Trust that you’ll be wearing these outfits whenever you can.